…we’ll almost, at least very cheap motoring is the plan! The Golf GTE 1.4 TSI produces 204PS (Pferdestärke, abbreviation of the German term for metric horsepower). It is a PHEV (plug-in hybrid electric vehicle) 5dr DSG boasting 0–62mph in 7.6 seconds. and up to 166.0 mpg. The electric range is 31 miles and when electric and petrol combine, the total range is 580 miles. The previous data are laboratory figures of course, I will report back on what happens in the real world in due course. However, its performance is very impressive so far. 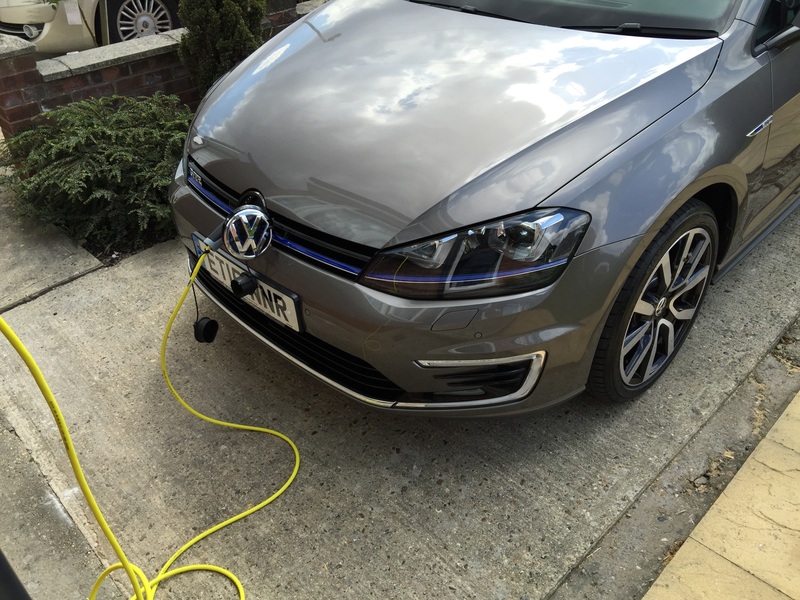 Because the car is a plug-in hybrid it attracted the £5000 government grant. More on overall prices later though because cheap mileage is all very well but initial and running costs still have to be considered. The other part of my cunning plan involves solar panels (actually photo-voltaic or PV panels) and these will be used to charge the 8.8 kWh lithium-ion battery in 3.75 hours from a domestic mains outlet, or 2.25 hours from a domestic wallbox. 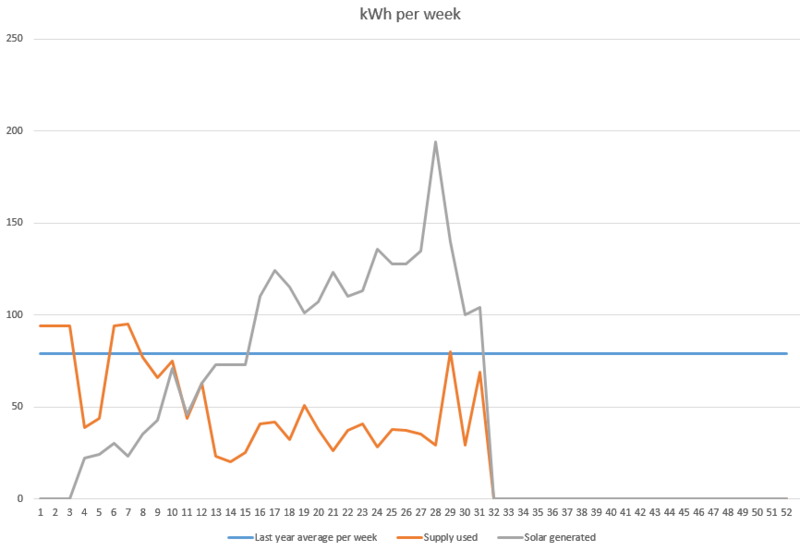 Comparison of grid power used with solar generated and last year’s average use (09/08/2015). As you would expect, we pay much more for the electricity we use than the price we get when selling it (something like 14p per unit when buying and 3p per unit when selling). 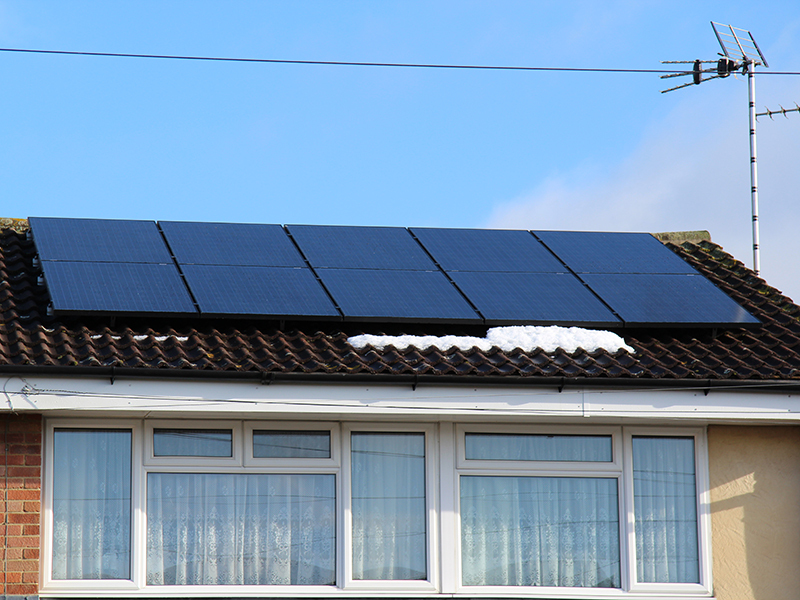 The way the feed-in tariff works is that the electricity generation company pays us for 50% of the amount generated by the PV panels. So the more we generate the more we get but of course the other advantage is gained because the more of the PV energy we use, the less electricity we purchase. This is where the new car comes in. The plan is that whenever we return home, we will make sure all the available charge in the car’s lithium-iron (Li-on) traction batteries has been used up. This will simply be done by switching the car to full e-mode when 35 miles from home. The car will now only be charged when enough solar energy is available (emergencies excepted of course). I am doing this manually at the moment but it will be automated in due course. I have just completed a journey, by pure coincidence, to the UK VW headquarters where they have a charge point (well they should have shouldn’t they)! This was about a 170 mile round trip for me. I set off with a fully charged battery and managed to add 20 miles worth of charge while I was there. The car trip computer showed an overall average mpg of 68 – so just under 2.5 gallons. for the journey. My previous car (a modern Golf GTD 2.0ltr) would have done the same at an average of about 48 mpg (about 3.5 gallons). This journey was a good combination of country roads and motorway so probably indicates a good average. I did not try to save fuel or equally I didn’t accelerate/brake rapidly so the figures are probably quite a good start for real-world use. When used in hybrid mode only, the average was about 50 mpg . I am expecting to win much more on the shorter journeys we do, which will use no petrol or very little. My journey to the office at the IMI for example, is about 42 miles each way. We have a free charging point! My hope therefore is to only use about half a gallon of fuel for the return trip (60 miles on full electric and 25 miles at 50 mpg).